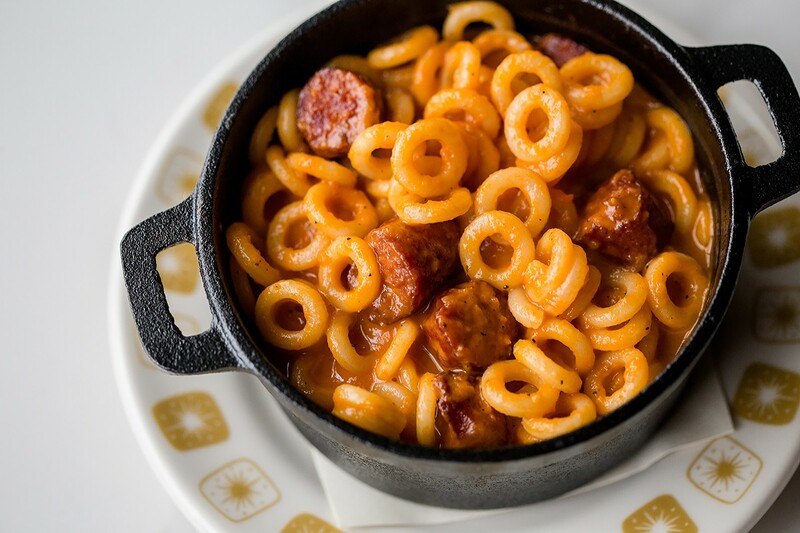 The Pasghettios is a grownup take on a familiar childhood favorite at new BCK Kitchen & Cocktail Adventures. Photo by Kirsten Gilliam. California-based, whiskey-driven bar and bites spot Bosscat Kitchen + Libations opened in the Galleria area back in 2017. Now, the team behind the successful West Coast import has turned its sights to the ever-expanding restaurant scene in the Heights. BCK Kitchen & Cocktail Adventures officially opened its doors on February 23. The ownership team is promoting it as a neighborhood eatery with “nostalgic American fare and approachable classic cocktails with inventive twists.” It’s located in the 3,000-square-foot space formerly occupied by Glass Wall at 933 Studewood. The restaurant’s menu features childhood favorites reinvented as adult fare. For example, there’s a nod to Chef Boyardee Spaghetti-O’s called Pasghetti-O’s, made with familiar O-shaped noodles but made more upper scale with 44 Farms beef sausage. The BCK Burger an elevated riff on an unnamed-but-famous fast food cheeseburger. BCK Kitchen & Cocktail Adventures is in the former Glass Wall space in The Heights. Photo by Kirsten Gilliam. Not every dish sounds like kids’ food, though. Others that are nods to the diverse heritages of the ownership group sound much more sophisticated. One such dish is the Vietnamese beef stew inspired by Houston native Tai Nguyen. Beef, carrots, potatoes and spices come enveloped in puff pastry. Vinnie’s Steak Sandwich, is named for Vinnie Capizzi and features carved ribeye, lettuce, tomato, executive chef Peter Petro’s OMJ (“Oh my Jesus”) sauce. Some selections sound downright healthy, like the chilled white bean salad with asparagus, tarragon and lemon; and the Goddess of Greens with Romaine lettuce, arugula, spinach, avocado and Green Goddess dressing. 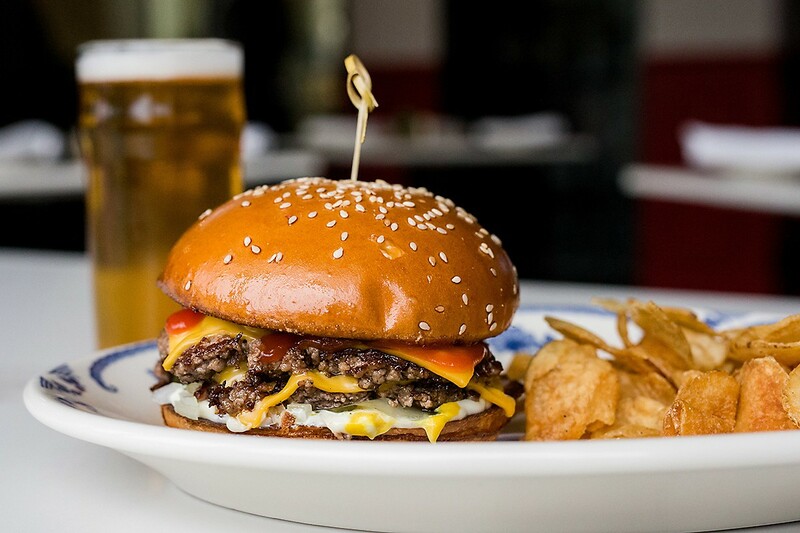 The BCK Kitchen burger is the restaurant’s take on a particular fast food burger. Photo by Kirsten Gilliam. Hanging next to BCK’s glass-enclosed kitchen is a “Local’s Board”—a large piece of butcher paper where guests can submit their own childhood favorites. Every month, BCK head chef Jeff Fernandez, Petro and general manager Anthony “AJ” Garcia will select customer-submitted dishes to be featured on the following month’s menu. Like Bosscat Kitchen, bar manager Chrisia Araujo’s cocktail selection favors whiskey. The Steady Hand is a mix of cognac, bourbon, triple sec and bitters that’s aged for 7 to 10 days and served over a block of ice with lemon zest. Other cocktail highlights mirror the childhood nostalgia of the food menu. These include Dr. Feelgood, a rye whiskey concoction served in a Dr Pepper can with crushed ice; Berry Crunch Milk Punch featuring Buffalo Trace whiskey, Cap’n Crunch Crunch Berries and Strawberry Nesquik; and the First Crush with Jim Beam Vanilla, Orange Crush soda and cream. The old Glass Wall restaurant space was redesigned by Joshua Weisman of Construction Concepts, and has seating for 108, including 16 bar stools. Patio seating facing Studewood is coming soon. 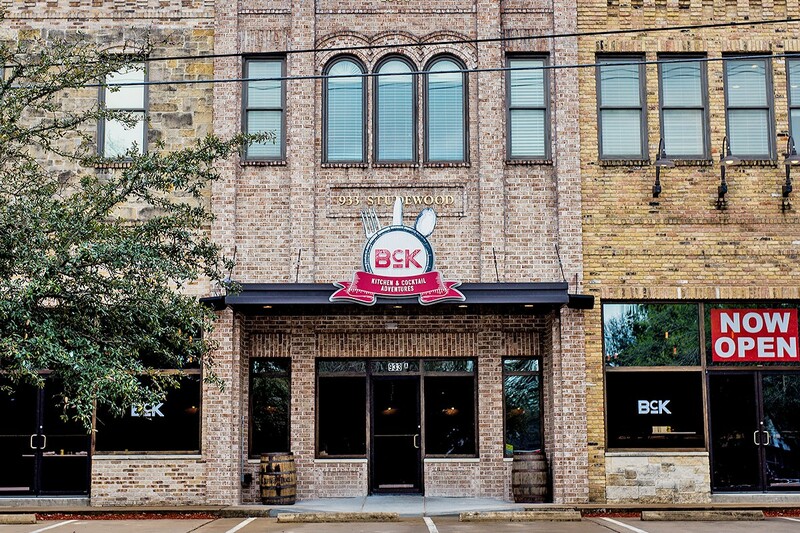 BCK Kitchen & Cocktail Adventures is located at 933 Studewood and is open from 3 to 10 p.m. Monday through Saturday. Reservations can be made online or by calling (832) 831-7155.